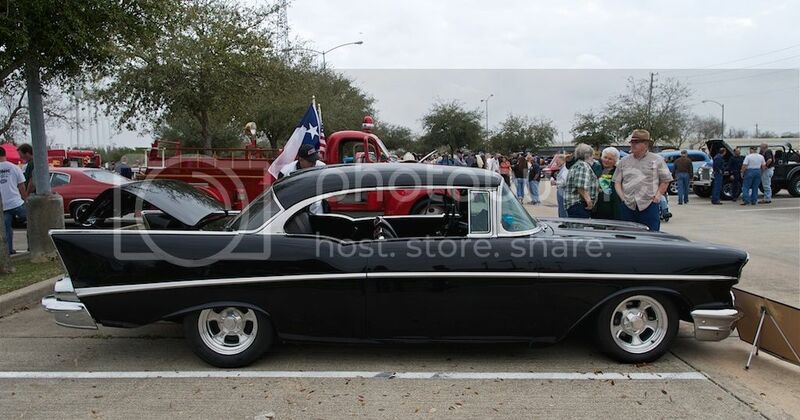 For reasons I don't completely comprehend, our community of Lake Jackson today celebrated it's 70th anniversary with an auto and motorcycle show (complete with vendors selling the artery-clogging foods Texans adore). The show contained the usual mix of '60s muscle cars; scads of contemporary Corvettes, SVT Mustangs, Camaros and Challengers (all of which you can see parked at any mall), and various hot rods. However, there were two cars that stirred my interest: a '63 Corvette split window coupe and a '71 Camaro. I also took a couple of shots of an example of the ubiquitous '57 Chevy; these cars are considered icons by some (I've never felt the vibe) so I included the pics in this trio of Chevys of yore. The Vette is truly something - a 340 HP, 327 car that the current (and second) owner fully restored (frame-off). This is a true garage find - a matching number car which even has the original chalk marks (retained during restoration) made when the car was assembled. Unlike everything else I saw today, this is a concours-level car, which the owner drives only on and off the truck that tows it to shows. The '71 Camaro, a car which you don't see often these days, is especially interesting to me, since Connie and I bought one new that same year. I adored that car - something I can't say for the two Camaros that followed it. Agree - the Vette & Camaro are niiiice! 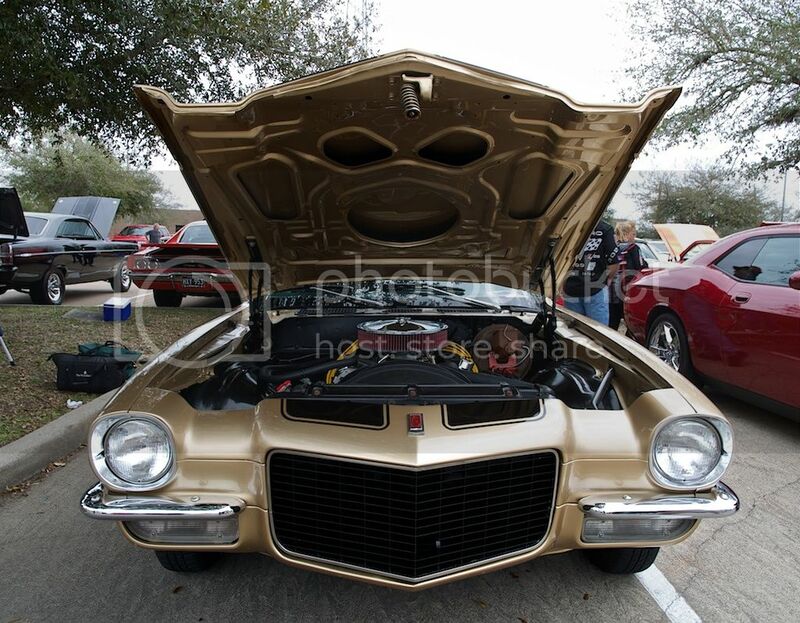 I had a '71 Firebird I truly loved, so that early 70's body style really does something for me. 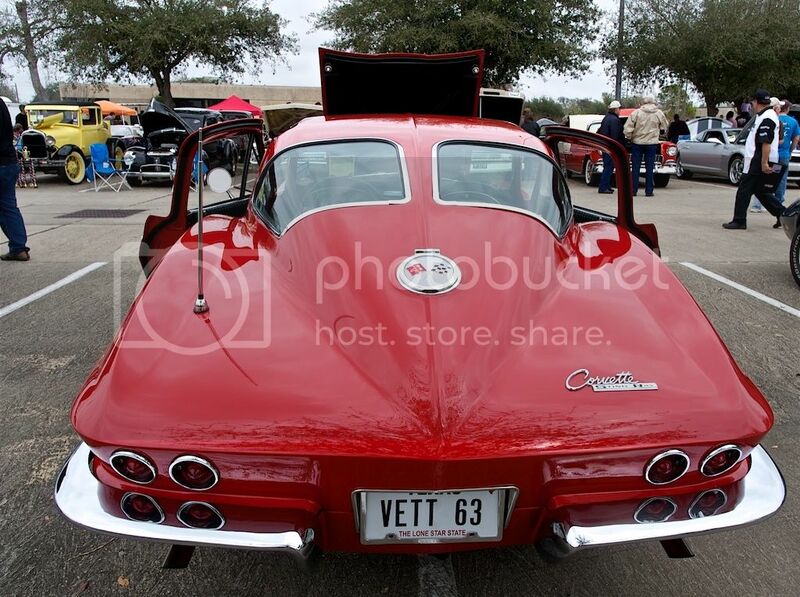 And who doesn't love a '63 split window Vette? 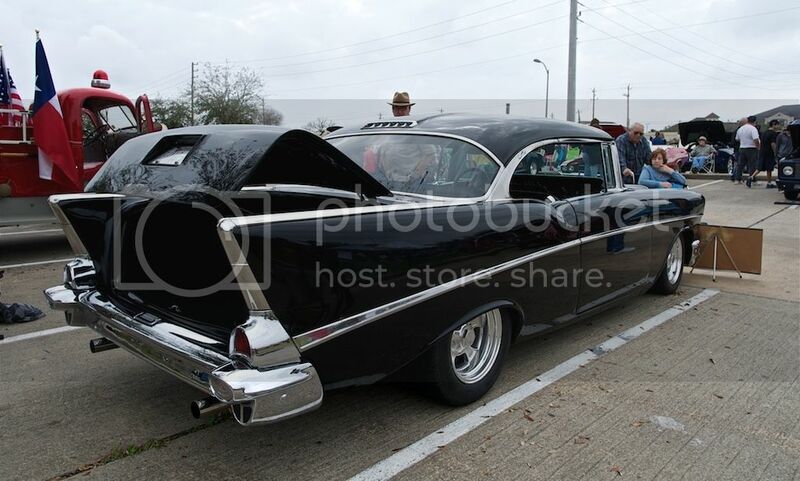 '57 Chevys are classics, but that particular one doesn't do a lot for me. Nice shots! Now I am starting to drool, don't you know it's not nice to tease old car guys. Nice shots. 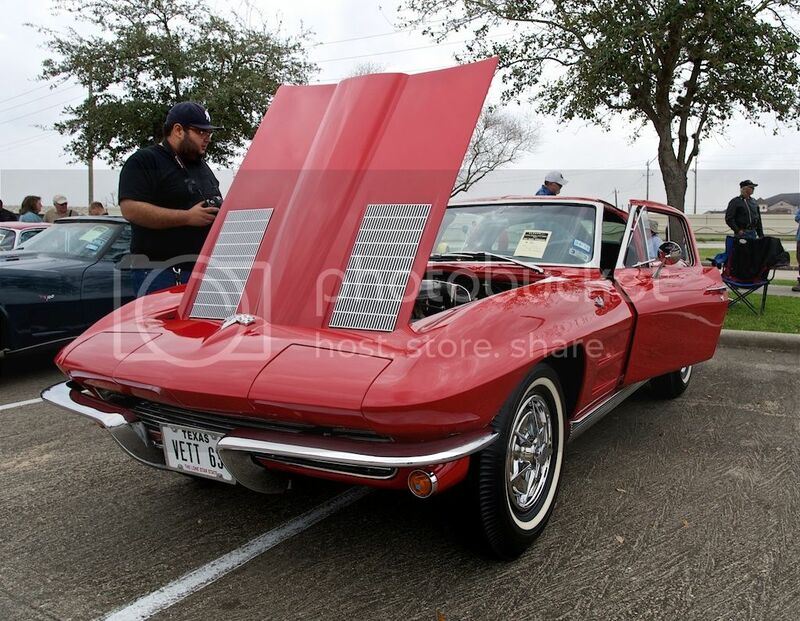 That 63 vette looks showroom new. 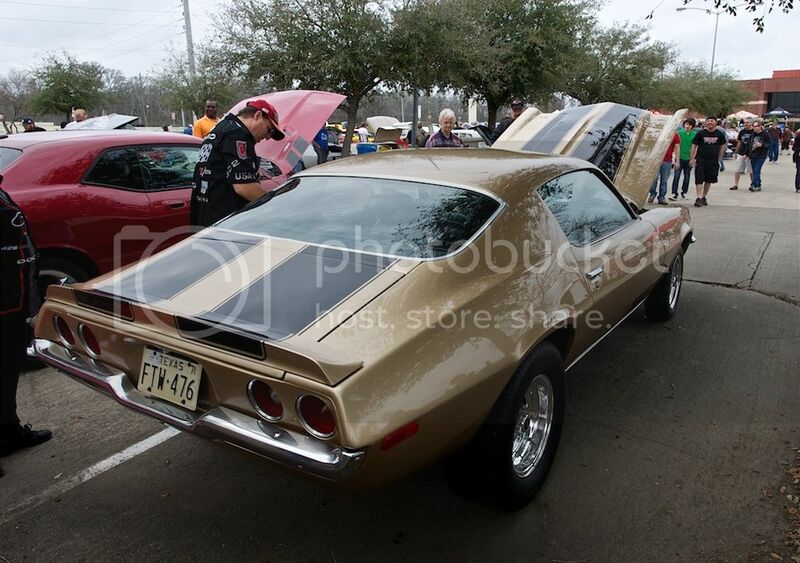 The Camaro is one of my favorite styles and the gold with black stripes is perfect. Thanks for sharing these. The only thing I saw today here in the Austin area was fog and drizzle. Now that is one beautiful Vette! Wonder what the value is. I admit to always liking the '57 Chevy (I had a black '55 2-door and a '70 Chevelle 2-door), but I agree with paulh that this one really doesn't do much for me. Of course if the owner suddenly decided to give it to me for my birthday, I would most graciously accept it. Very nice, Jer. That split-window Corvette looks great. The owner of one of our local butcher's shops is an American V8 tragic and he has one of these, but it's absolutely not in as good condition. Love the Camaro. That gold and black paint scheme is one of the best in my opinion. The only one I got to drive was a '68 convertible in 1973. 327 manual shift, orange/red with black stripes, side-pipes, wide wheels, manual steering. Very heavy going round corners but fun to drive. By the way, my white 1989 Saab 900 Aero was sold yesterday. A guy flew down from Brisbane (1,100 miles away), took it for a test drive and that was that. Wipe that chin, brother Bob (I've used two handkerchiefs already). I'm glad you enjoyed the pics. The Corvette is pristine - an amazing car. Since it's a matching numbers car, I'm betting the Vette is worth a young fortune. The '57 Chevys have never done it for me - even when both they and I were new. They always make me think of a match box with fins. Thanks, buddy. 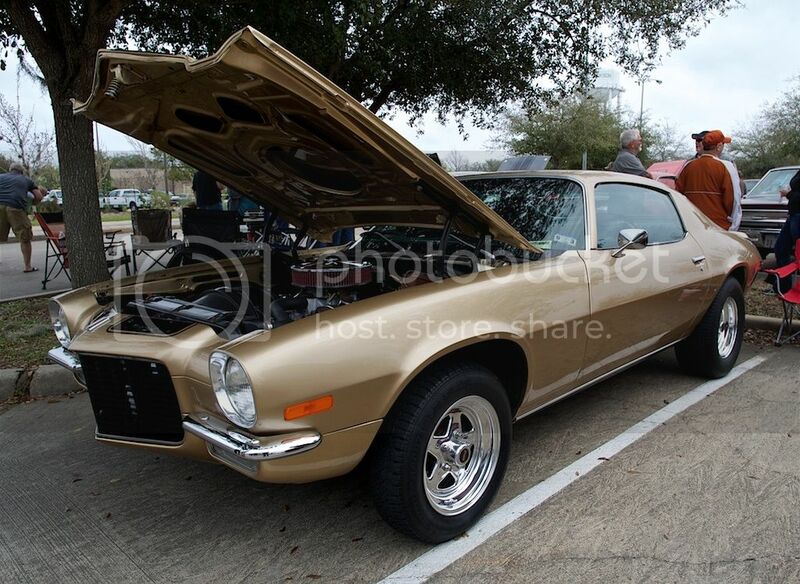 I certainly loved my '71 Camaro - my first Chevy after a series of two Mustangs and a Cougar. It sounds like your old friend has found a new home - my recollection is that you've owned the car for a long time???? Anyway, you've got that new red one to enjoy! I remember the Corvette and Camero well. That model of Corvette remains my favourite. It is a strange way to celebrate a birthday, but I guess the car and motorcycle show is somehow representative of the population. That corvette is sweet. Real nice pics... In another life I was a muscle car divorcee... replaced by a 67 nova ss. A passionate cult-ure, for sure. Some great cars - all-time classics! Thanks much, Tom. That Vette is a stunner for sure. I find it odd, as well, tess. Thanks for the kind words, and car folk can be passionate, indeed. Yes they are, Norbert. Thanks for looking, my friend. Jer, the 63 was the first to be called Sting Ray, to have independent suspension, hidden headlamps and the first offered in a coupe. A fellow in town purchased a new 63 and when the 64's came out the split rear window and hood vents were eliminated. He took the 63 Vette into the body shop and had the rear post removed and the new full width window installed, a new 64 hood was added to make the transformation complete. No kidding? I got weak in the knees just looking at this one. I'm thinking your C-2 was a later model, a roadster and had the big block 427 - that sucker must have been one helluva car. I had the 66 roadster, 425hp model. Few people can say they owned one of those, my friend.